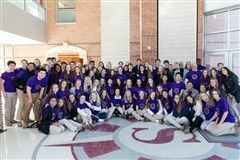 At Severn School, we are scholars, innovators, athletes, artists and more. We believe in character conduct, scholarship, leadership and service. And most of all, we believe in each other — we are family. These are the stories that tie us together. Have you ever been to a naturalization ceremony? It's a hopeful, dignified event that symbolizes a new chapter in the lives of people who were once only seen as visitors to our country, newly recognized as full citizens with all the accompanying protections and responsibilities. 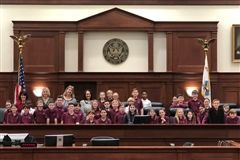 Every year, Severn fourth graders participate in a naturalization ceremony as a culminating activity for their study of immigration and personal heritage. Through this experience, our students not only learn about the path to citizenship, but also develop empathy and a broader understanding of what makes America such a diverse and thriving country. Best-selling author and educator Julie Lythcott-Haims shared two very different, personal and thought-provoking presentations for our 2019 David Astle Memorial Lecture on April 9th. 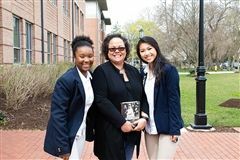 Reading excerpts from her memoir, she challenged Upper School students to find compassion and empathy for the experiences of marginalized people in our country. Later that evening, she shared personal stories from her life as a parent, struggling to find balance between supporting children’s growth and preparing them for independence. Through both talks, the author revealed the full spectrum of her experiences — from anger and frustration to joy and belonging — leaving both crowds inspired to create a better world for ourselves and each other. 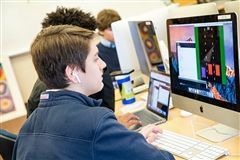 In our Upper School introduction to computer science classes, students learn the basics of Processing, a programming language similar to Java. But more than that specific language, they learn the developer mindset; a way of thinking that welcomes struggle as part of the process. Students tackle open-ended challenges without a prescribed path to follow, working at their own pace and in their own style. For the final assignment of the quarter, teacher Mr. Alan Kraut gives his students the freedom to design and build their own programs. 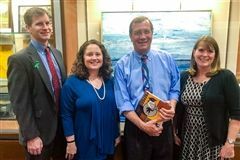 Each year The Capital Gazette, Anne Arundel County Chamber of Commerce, and other local groups elect students to receive the Outstanding Student Achievement Award. 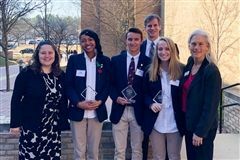 This year, three Severn juniors were honored at the award ceremony on March 13th, 2019 along with other outstanding students from the Anne Arundel County community. 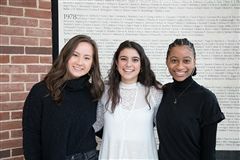 Join us in congratulating Danica Williams '20, Samuel Bruce '20, and Lindsay King '20 for their remarkable academic achievement, success in the visual or performing arts, and/or exceptional citizenship in our school and the surrounding community. 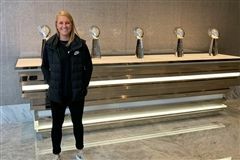 The following is a reprinted version of the Capital Gazette article, click here to read in its original location. 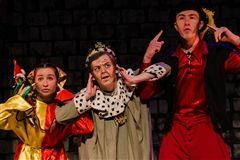 The weekend of February 21st our Water Street Players staged the hilarious musical comedy "Once Upon a Mattress," a side-splitting Broadway production based on the Hans Christian Andersen fairy tale "The Princess and the Pea." Their rollicking spin on the familiar classic of royal courtship and comeuppance had the audience in stitches with Renaissance-inspired shenanigans! The following is a reprinted review of the show from Sharon Lee Tegler of the Capital Gazette. Read the article in its original location here. If You Could Draw Jazz, What Would It Look Like? 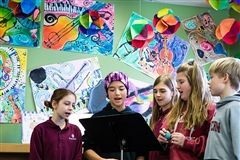 Over the past several weeks, our 5th-grade students explored American Jazz as researchers, artists and musicians. 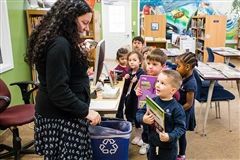 Librarian Ms. Pilar Okeson teamed up with art teacher Ms. Jonnie Friedman and music teacher Ms. Mary Gaylord to create a multisensory unit based on the music of Duke Ellington, Ella Fitzgerald and Trombone Shorty. Did you know that some of the first home computers looked more like table tops than the ubiquitous keyboards with glossy screens that we see today? Our 2nd and 3rd-grade students got a personalized tour through the evolution of technology at the Computer History Museum in early February. 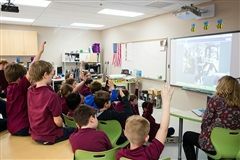 Perhaps it's more accurate to say they got a robot's-eye look at the famous museum located just around the corner from Google HQ in Mountain View, Calif. With Lower School technology specialist Ms. Vicki Dabrowka at the controls, our students explored the museum through the eyes of a telepresence robot. Many topics in science are straightforward. Few people will argue whether or not water is made of hydrogen and oxygen. But issues more closely tied to human behavior are often debated in both academia and the court of public opinion. What is the extent of human impact on global climate change? Are there benefits to holistic medicine? We look to the scientific community to answer these questions, but even within those circles, there are varied perspectives. 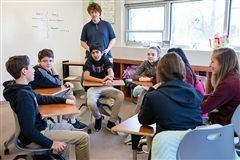 Upper School chemistry teacher Mr. Nick DeMarte asks his classes, “If science is a body of facts, why are there different opinions?” And then the debates begin. 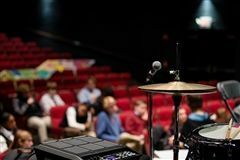 Our 2019 Dillon Moran Musicians in Residence program was a two-day musical event unlike any other at Severn School. Jill Collier Warne, Sam Mumford and Ross McDouall of Creative Connections took the stage on Thursday morning with a set of drums, sampling and recording equipment, a guitar, and a cello. But instead of beginning their residency with a complete performance as many have in the past, they put out a call to our community. “We have some very small musical ideas,” said Sam “but we want to access your voices and your thoughts about your community and the way you see yourselves in society.” Over the next two days, students from our Upper and Middle Schools worked with the trio to create the unique multi-media performance, "I Collecting us." 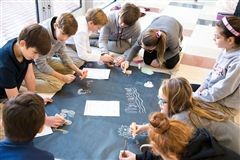 At the end of last quarter, our 6th-grade classrooms buzzed with energy as students prepared for an interactive museum bringing together weeks of hard work. 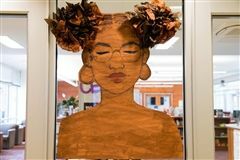 Based on Deborah Ellis’s award-winning young adult novel The Breadwinner, this project gives our students a broader view of the world. It helps them make connections from one class to another, one person to another and one culture to another. 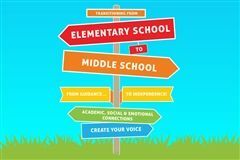 When students are young they may feel as though their voices are not heard. However, this is not the case at our Lower School. 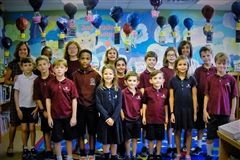 Every semester two students from each second through fifth-grade class practice leadership, teamwork and service with the Lower School Student Council. 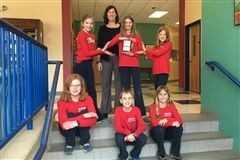 Their main task is to work together to complete a service-learning project involving the entire school. This semester’s council chose to support Lucky Dog Animal Rescue. During the final week of this project, we interviewed our Lower School leaders to learn about their experience. As one 3rd grader said, "A lot of it was hard, but it feels good that we have achieved this much." Have you ever spoken to a large audience? Shared something personal about your life or someone close to you? 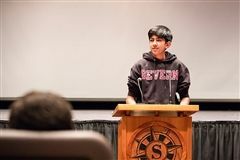 Public speaking can be challenging even for those who do it frequently. It involves a complex set of skills, hours of preparation and the courage to make yourself vulnerable to the onlooking crowd. 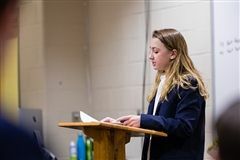 As challenging as it can be, public speaking is an essential tool to create positive change in our community and the larger world. With English teacher Mr. Joe Christie as their guide, our middle schoolers face that challenge head-on with the 8th Grade Public Address.